Area snowmobilers took advantage of the snow and open snowmobile trails to get out and ride this weekend. There was a lot of traffic using the trail to and from Pewaukee Lake. You can support our club’s efforts to keep that trail open by joining the club or by purchasing a Waukesha County trail map at Gina’s Sports Dock, Curly’s Waterfront, Carlee’s or at Don and Roy’s Motorsports. The Moon Shiners Snowmobile Club made a $300 donation to Pink Ribbon Riders, a non-profit organization that provides financial assistance to men and women battling breast cancer. The donation was made in support of club member Chloe Krumenacher, 19, who raised funds for the organization by participating in the annual St. Germain Bikini Radar Run on February 3, 2018. In all, Chloe and her family raised over $1,450 for Pink Ribbon Riders. Several Moon Shiners Snowmobile Club members have had family members and friends battle this disease so the decision to support this organization made sense and were happy to give back to those in need. Trails Remain Closed… for now. Stop on down to the Snowmobile USA Show going on this weekend at State Fair Park from October 13 – 15. Look for Moon Shiner Club members at the Waukesha County Snowmobile Association’s booth #129 and purchase raffle tickets or join the club. Also check out all the deals at the WCSA Swap Meet going on in the square just outside the north gate of the Exposition Center Saturday and Sunday. 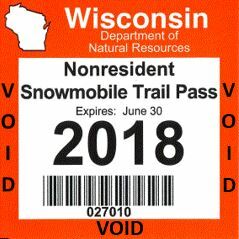 Your invited to join the Moon Shiners Snowmobile Club at their first kickoff meeting and social of the snowmobile season at Nettie’s Irish Pub in Pewaukee on Tuesday, September 19 at 7:30pm. Our Trail Master will be cooking up some brats and burgers for all who attend. We will meet in the back room at Nettie’s. It takes the efforts of volunteer club members to prepare and maintain the snowmobile trails each winter in Wisconsin. Let this be the year you join the club and become a Moon Shiner Snowmobile Club member. Club membership is just $30 individual/family. For a list of benefit you receive, please visit our Join our Club page. 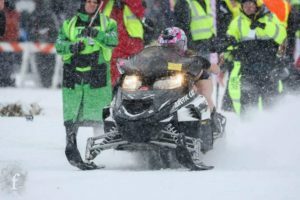 Chloe, a Moon Shiner club member, will be racing her sled on the ice at the St. Germain Discover Wisconsin’s Bikini Radar Run on Saturday, February 4th to raise funds for Wisconsin breast cancer survivors and their families. Please help her meet her goal to raise $6,000 for this cause. No matter how cold it is, she’ll be going all out to get her sled down the 660′ ice drag strip in the fastest possible time. You can support her by making a donation on her GoFundMe page. Please make a donation here. The Waukesha County Snowmobile Association will be closing snowmobile trails north of I-94 starting at 6:00 a.m. Thursday, December 22. Jefferson County is also closing their trails at this time too. Other Counties may be following suit, so please call the Waukesha County Snowmobile Hotline at 414.299.0330 before venturing out tomorrow. As of Saturday morning, most of Waukesha Counties trails are open. A couple of the Plat 5 trails are still closed as of this writing. They are the trails along Hwy 164 and Hwy Q and the trail from Sussex Bowl in Sussex to Village Bowl in Menomonee Falls. Please respect our landowners and stay on the trail at all times. As of December 12 at 5:00 p.m. so of the snowmobile trails in Waukesha County have opened up. At this time only the trails of the Mukwonago SnoSnoops, Kettle Moraine Riders SC and the trails in the Kettle Moraine Forest are open to snowmobiling. All other trails are CLOSED until further notice.